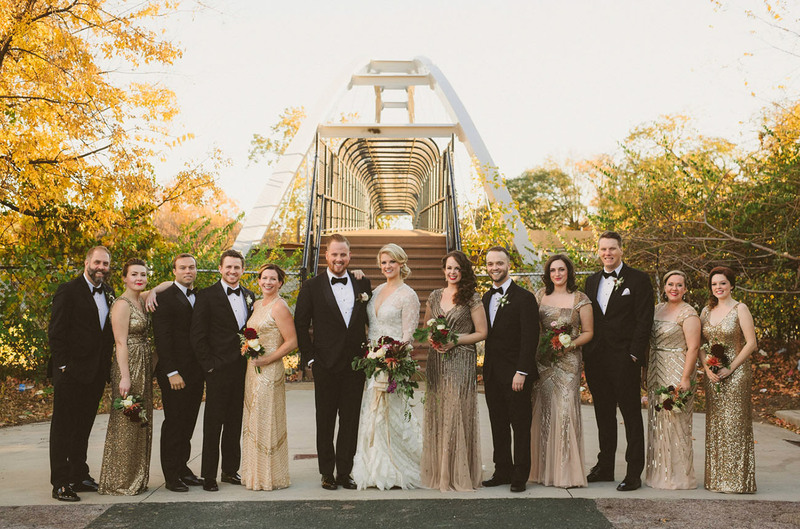 What do you get when you mix a love of Old Hollywood with modern details… Plus a touch of Nashville? 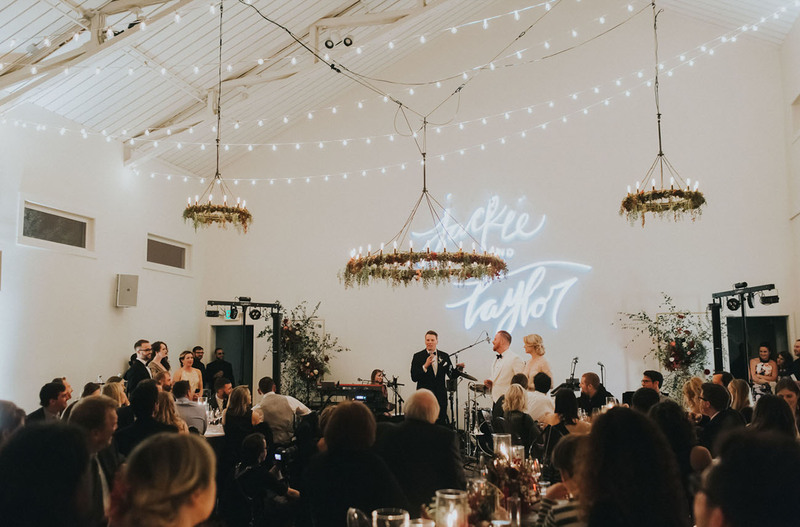 Jackie + Taylor’s glitzy + glamorous event at The Cordelle, designed + planned by Modern Vintage Events. 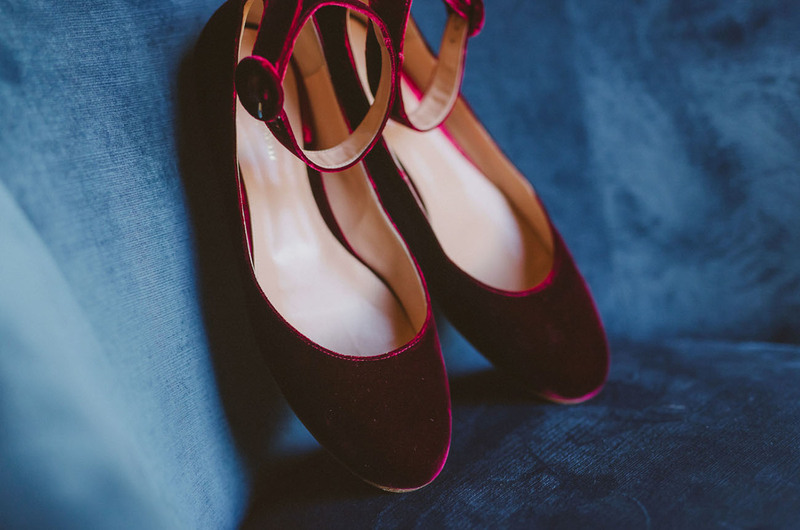 As a photographer, Jackie was very keen on all of the details for the day and truly wanted them to reflect their personal style. 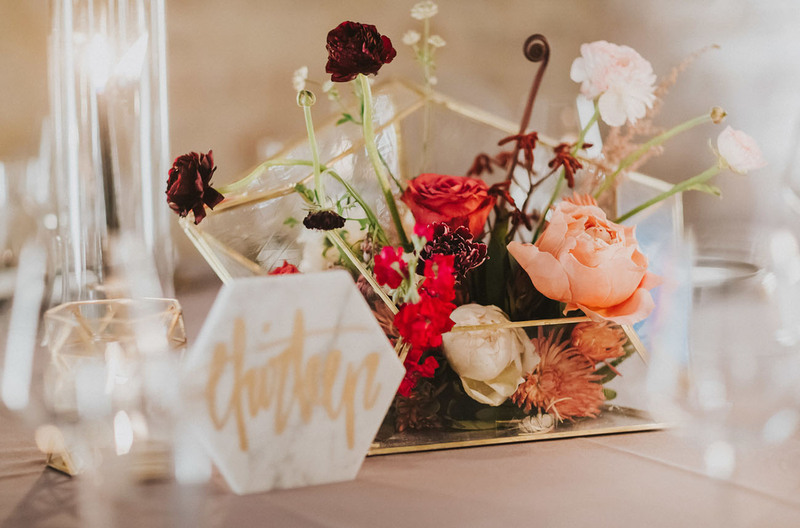 Together they came up with a unique blend between Old Hollywood and modern bohemian, accented with geometric designs and marble details. Sounds pretty? Just wait ’til you see the photos! As they live in Nashville + Taylor is in the music industry, live tunes were a definite necessity. 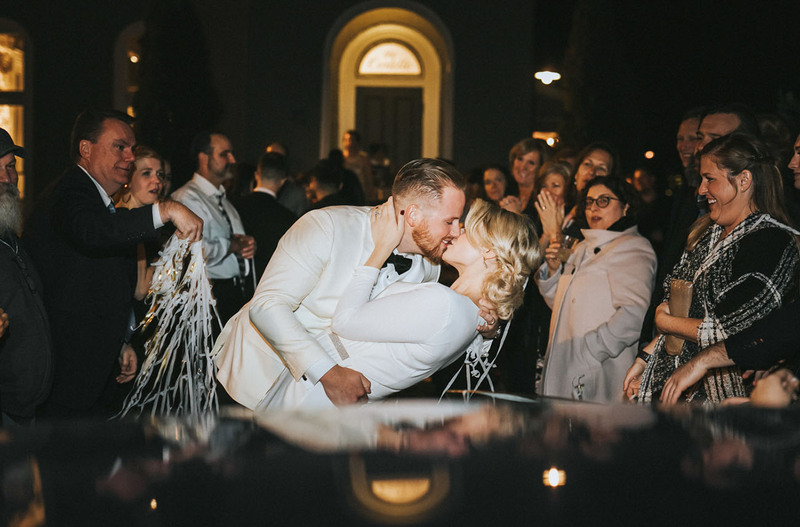 A drum line kicked off the reception hour, a live band kept everything swinging, and they found a DJ who only uses vinyl records! Jackie tells us: My best friend of 17 years sang our first dance song. If that wasn’t already special enough, it was written by my husband’s best friend. It was a truly special and incredibly precious moment. 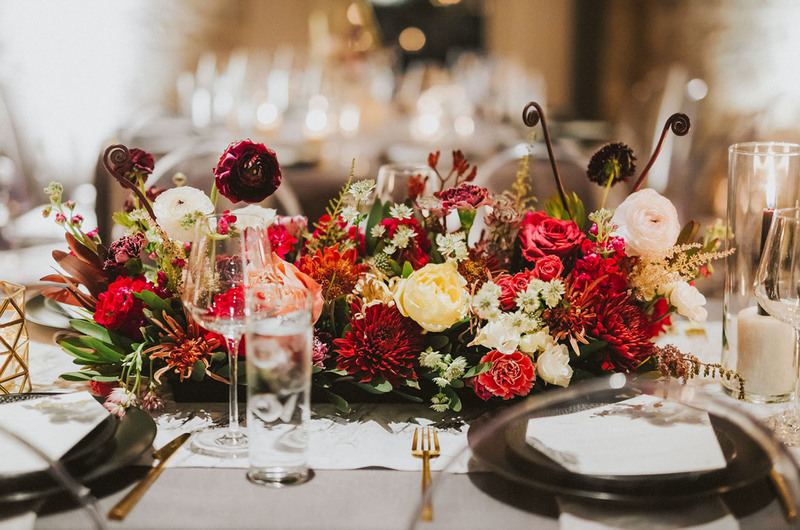 Let’s proceed to the party, captured in full by Aesthetiica Photography. 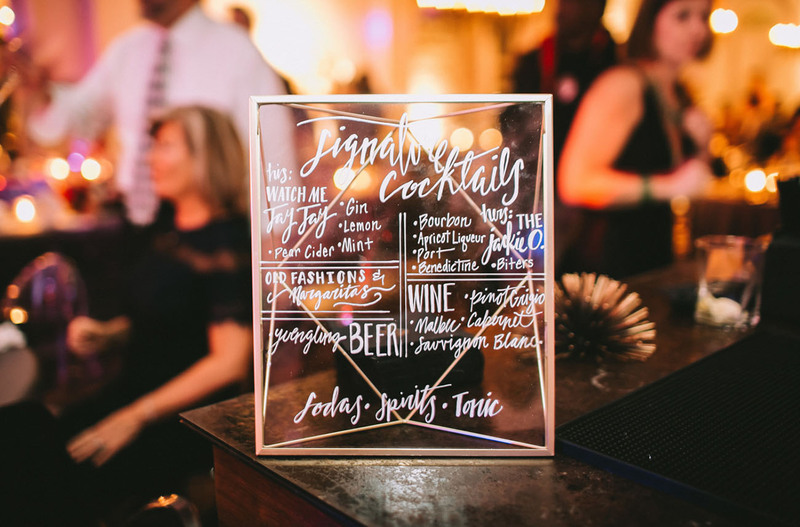 I created a watercolor design and hand-lettered our names for our invitations, and we chose to carry that over to the wedding decor as well as our photo booth background! 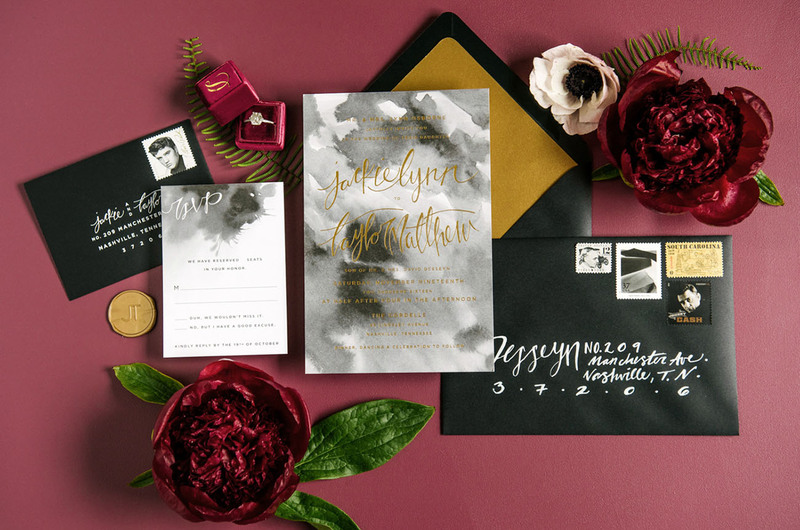 We’re loving that watercolor ink splatter. Too cool. 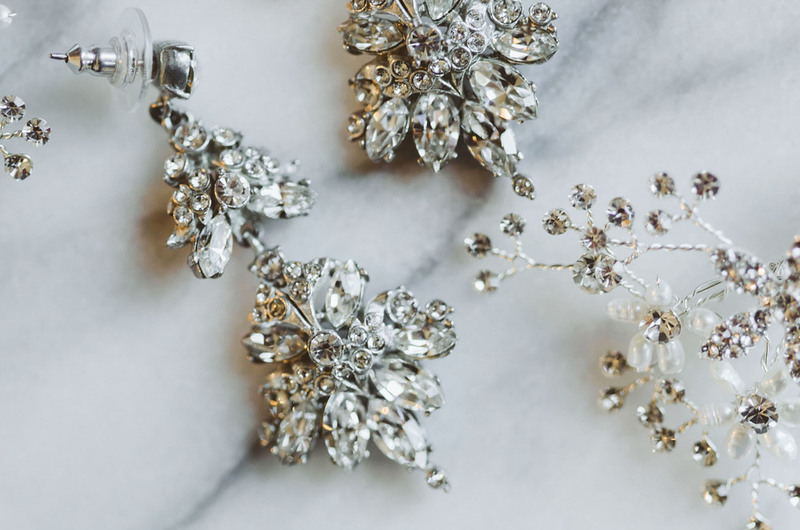 Taylor knew I did not have any family heirlooms, so he surprised me with vintage 1920s Art Deco drop earrings to pass on to our children… all the happy tears! Can we get a round of applause for Miss Jackie and that Lazaro wedding dress from Bridals by Lori?! 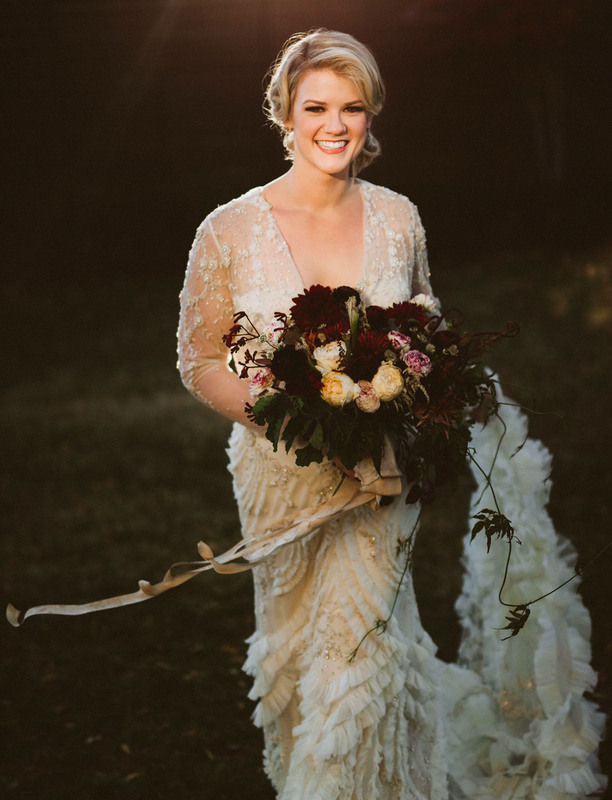 From the textured ruffles, to the elegant beading… And then those lace sleeves! Girlfriend has got it GOIN’ on! Taylor’s lookin’ sharp in his classic black tux. 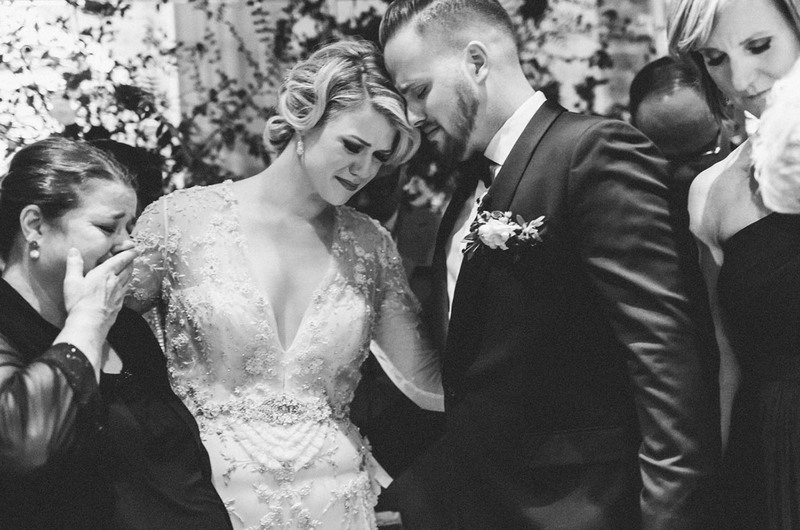 Our first look was beyond words, having that moment to breathe with him before we walked down the aisle was priceless. He held my face and my hands and spoke over us and our marriage. We just stood there and took in the moment before all the whirlwind that was to come. Holy smokes. 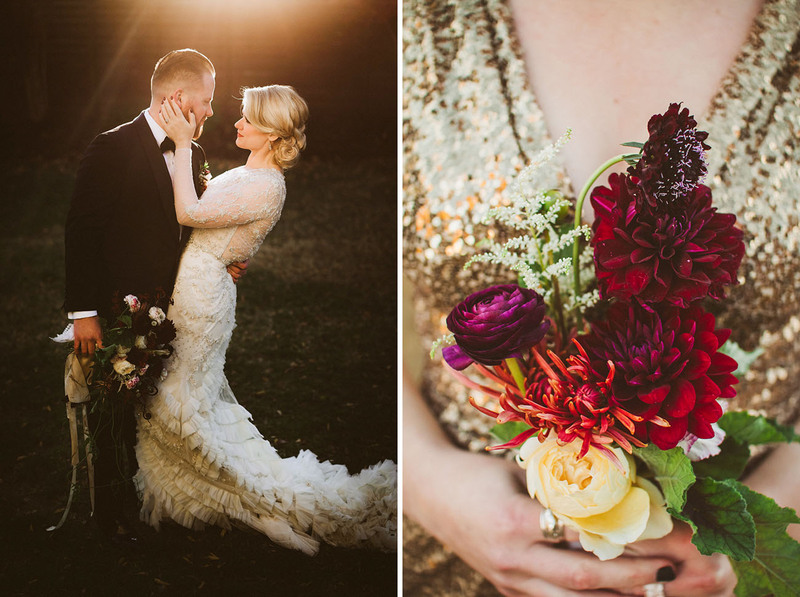 The couple + that golden light… OW, OW, OW! YES, YES, YES!! Such a stunning group. 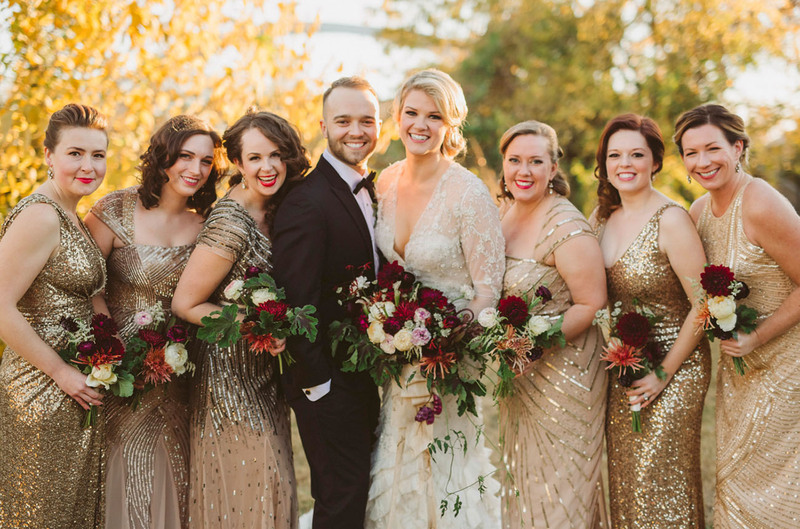 Sticking to gold tones, many of the bridesmaids dresses were by Adrianna Papell. 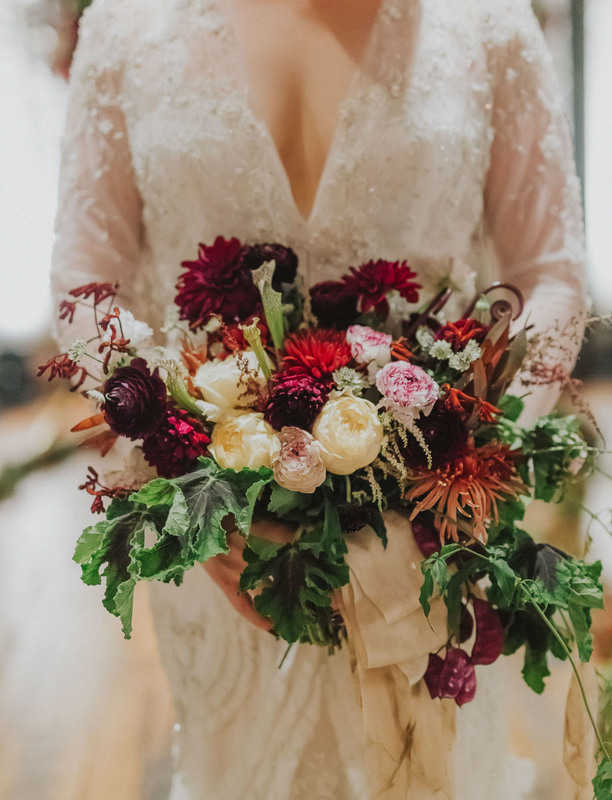 For the florals, Basil & Bergamot played around with moody tones of dahlias, ranunculus, carnations, and peonies, accented by a bunch of lush greenery. 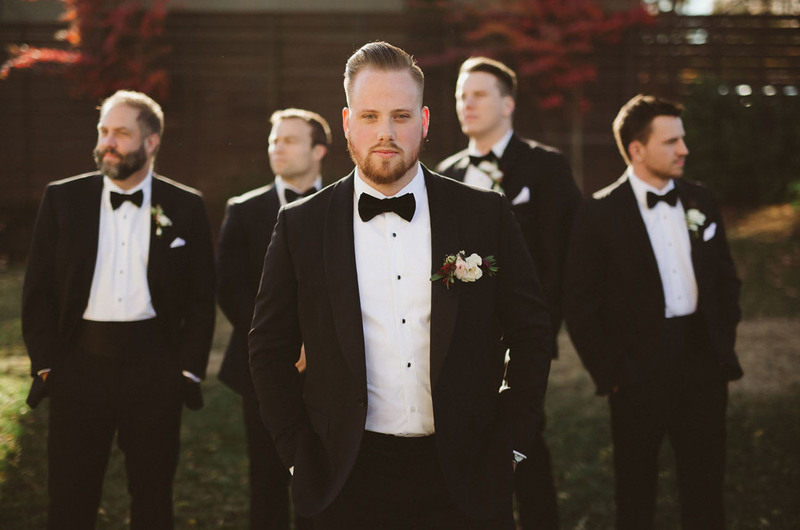 What an epic groom + groomsmen photo! How positively sweet is this? All the feels!! 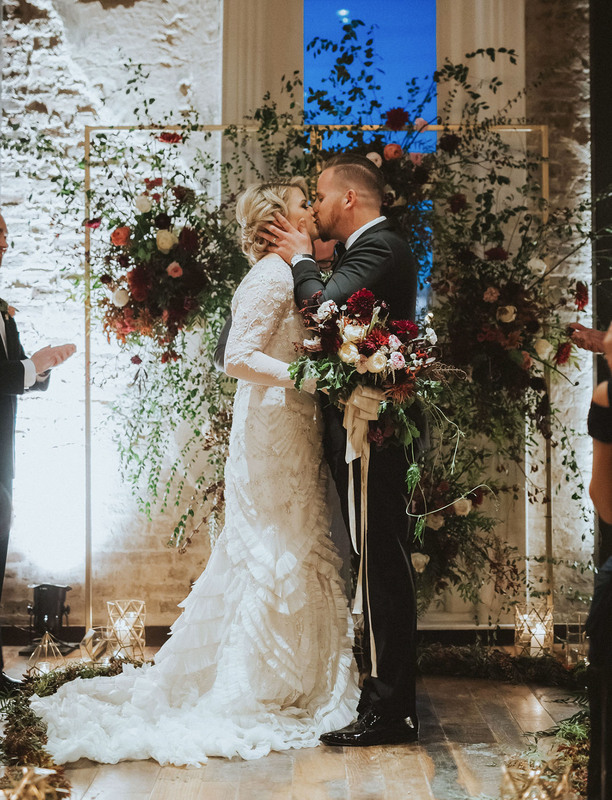 The exchanging of our vows was one of the most unforgettable moments of my life — to hear both of us say out loud our love and memories of one another in front of loved ones… We might have been so caught up in the moment that we hugged and kissed a little early (whoops!). Then, I slipped a ring on his finger that had “Always your Jackie O.” in my handwriting on the inside, because that is what he has always called me: Jackie O. Fun Fact: I actually purchased his ring from Tiffany because it is where the real Jackie O. purchased her jewelry. 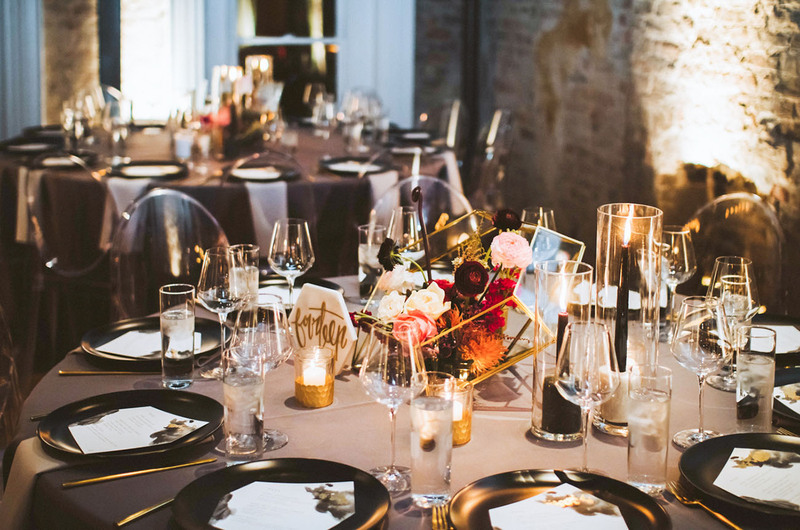 How gorgeous is this reception space?! 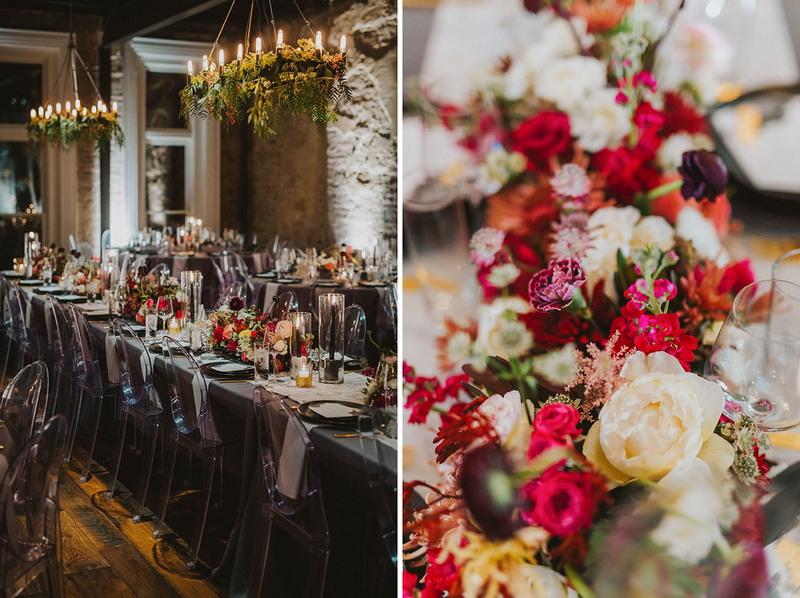 The already cool dilapidated brick walls set the stage for the scene and the long tables with ghost chairs completely elevated it! I come from a family of makers and it was really important to both of us to included our families in the process. My mother is a stained glass artist, and created many of our geometric glass center pieces along with sewing all of our marble runners. My father is a craftsman, so he built our cake table that I faux finished to look like Carrara marble. Creating these pieces for our wedding with my parents made the day even more special because it brought our families together! 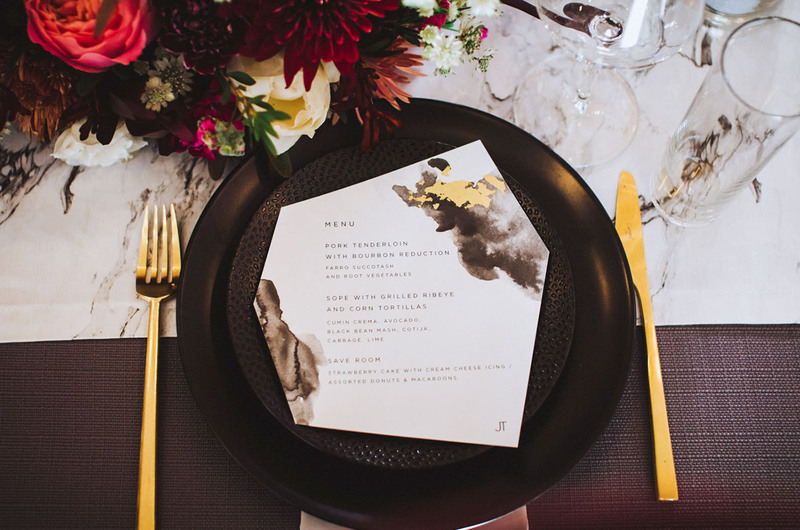 We sure do love that marble table runner, especially paired with the bold florals + luxe tableware from 12th Table! 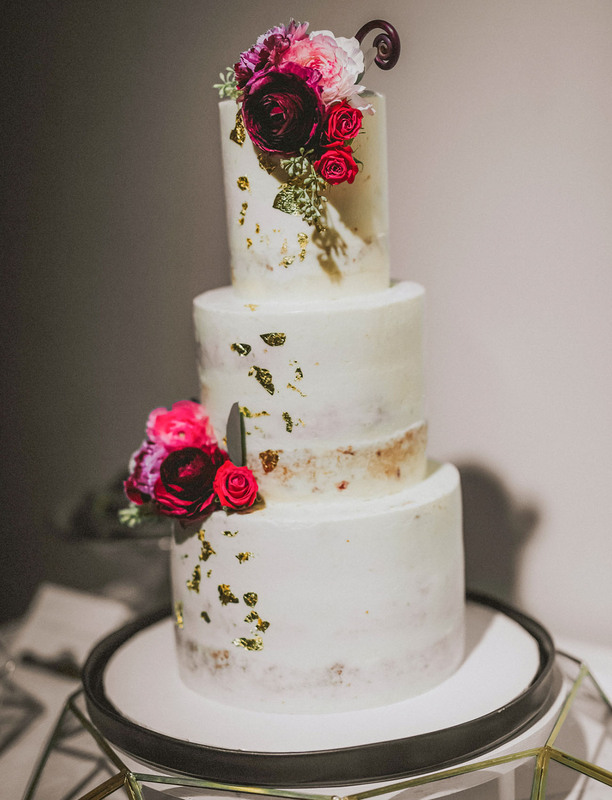 The dessert table was brimming with sweet treats from Five Daughters Bakery… Oh, and one utterly divine gold leaf naked cake by Baked in Nashville! The cocktail hour called for two personalized drinks: The Jackie O. + The Tay Tay. Jackie tells us: All Kentucky girls are (practically) required to have an inkling for bourbon, so naturally we had to include it! 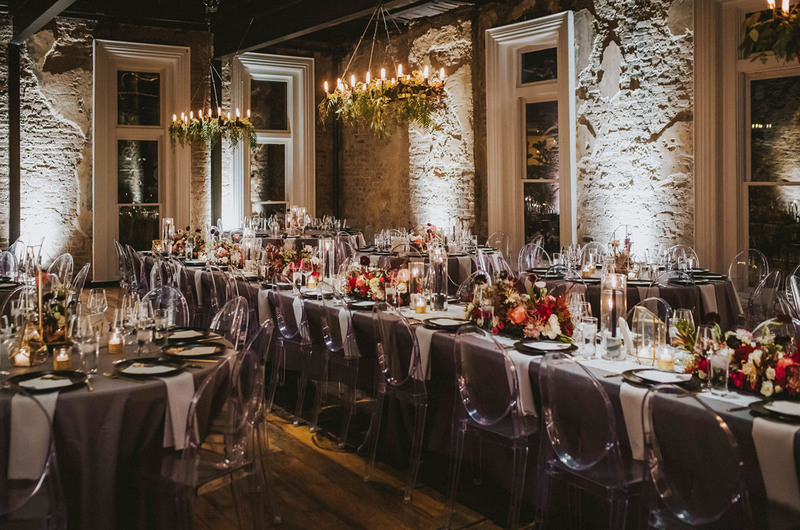 What a reception space! 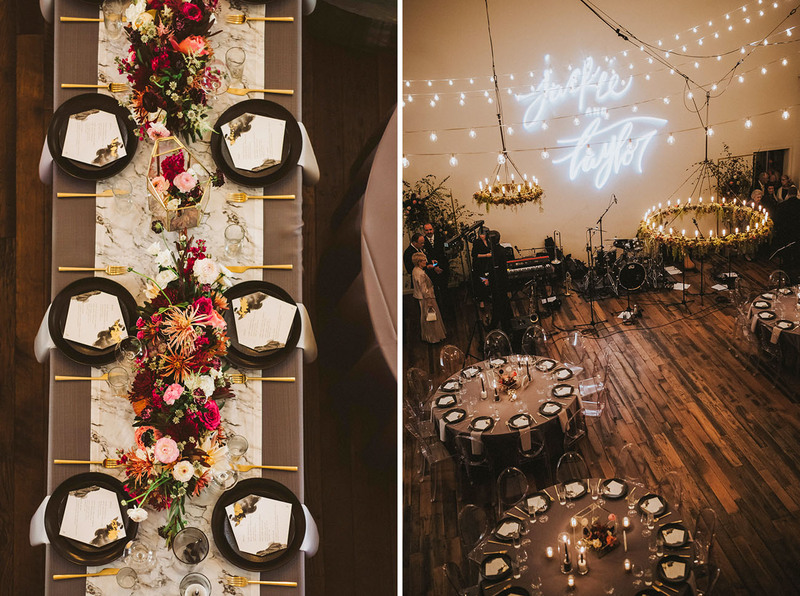 We’re super keen on those hanging floral chandeliers paired with the string lights + their names illuminated on the wall! 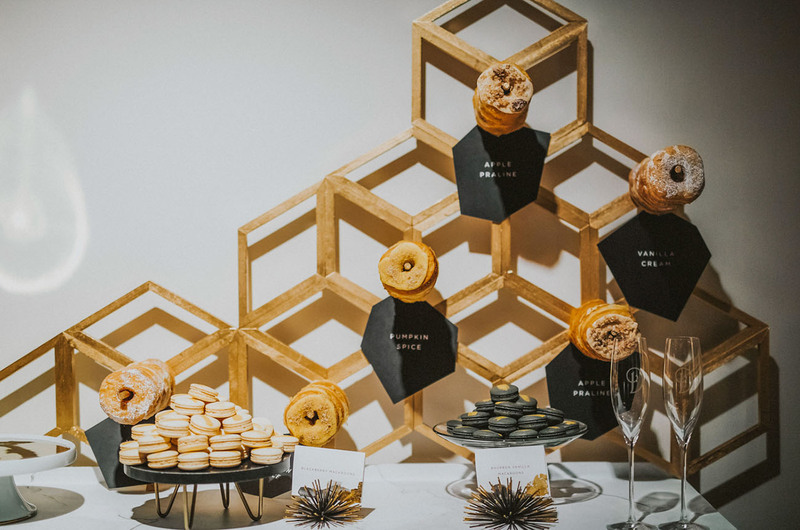 Jackie shares: The reception started with a bang! A terrible pun, I know, since a full marching band drum line welcomed Taylor and I into the reception. It was my last, and possibly the least expected, surprise for Taylor! 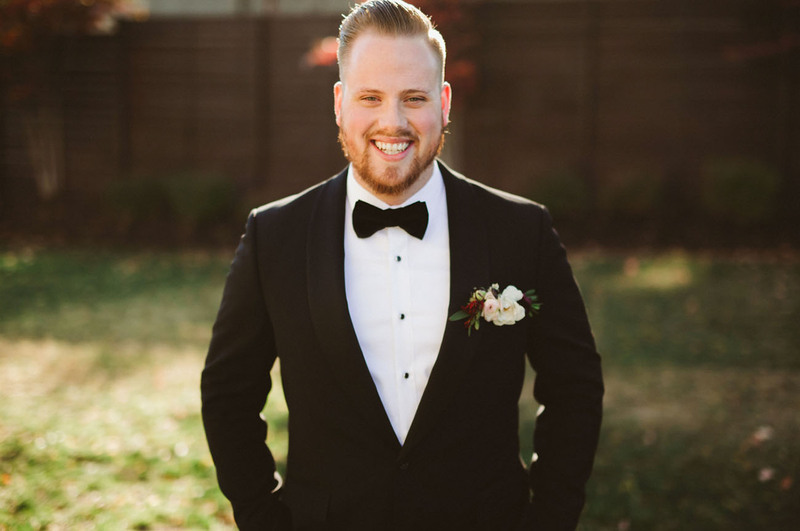 He grew up in drum line, it carried on to college, and then he moved to Nashville as a drummer. I think it took him a good 30 seconds to soak it in! 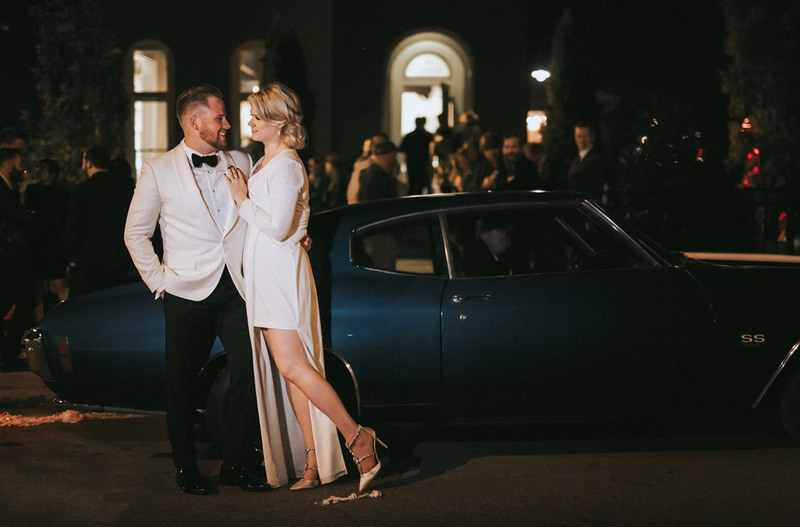 At the end of the evening my father drove us away in his vintage 1970 Chevelle Super Sport that he built himself and is a replica of the car my parents drove away in at their wedding. A magical night, indeed. 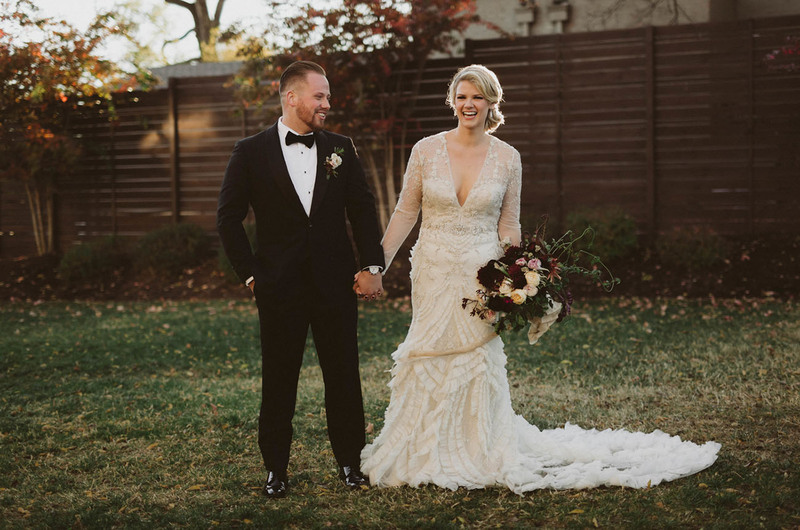 From the team at GWS, congratulations x 1000, Jackie + Taylor!! 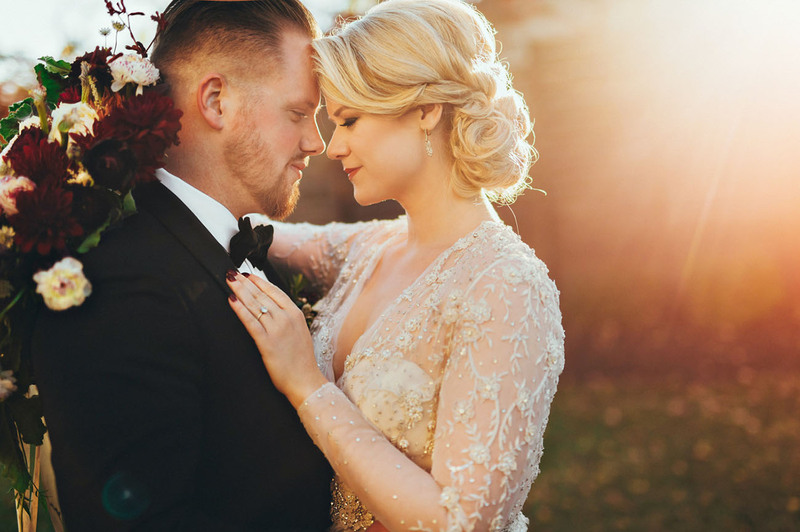 For more from this glitzy + glamorous day, check out this sweet snippet from White Heart Wedding Films! 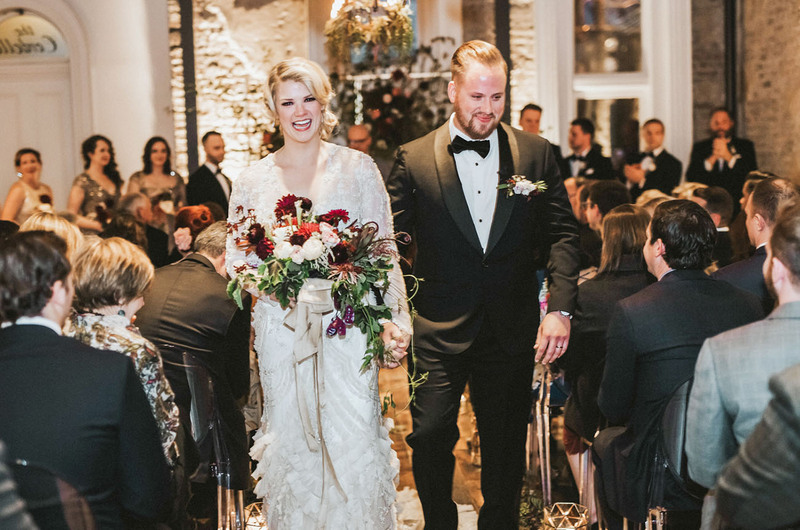 Such a beautiful wedding and a gorgeous couple! 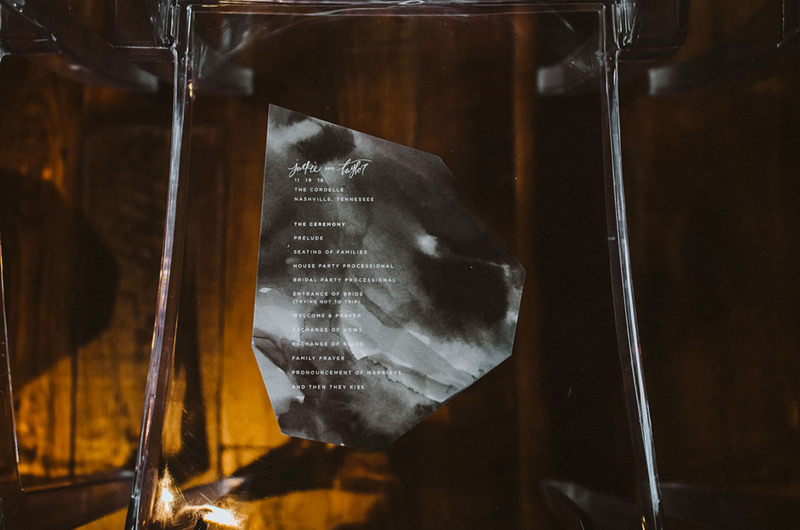 Loved the images, looks very elegant. This is really good. Congratulations guys!